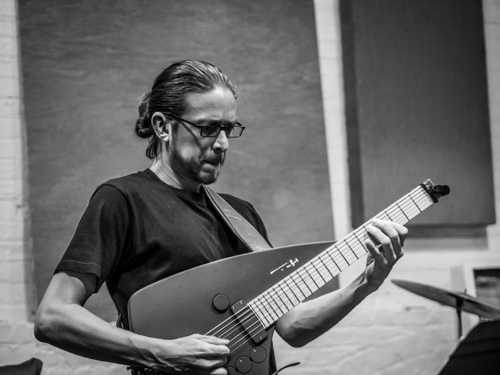 Harvey Valdes is a guitarist and oud player born in Elizabeth, New Jersey, living now in Brooklyn, New York. 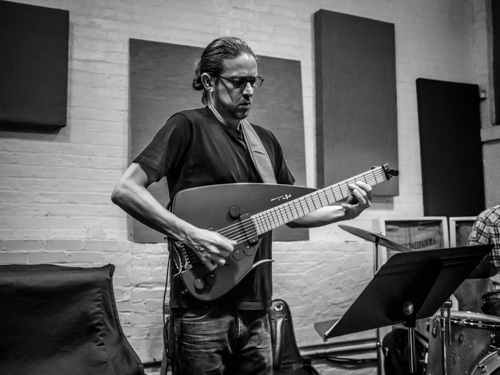 On his new solo guitar album of standards, Roundabout, Harvey steps away from jazz guitar tradition to craft a sound all his own. Using a finger style approach and a sense of felt time, Valdes effortlessly plays with multiple voices and complex counterpoint. His adventurous take on harmony creates many moments of spontaneous re-composition born of a free improvisational approach. Each track shines with the originality and sensitivity of Harvey’s voice. 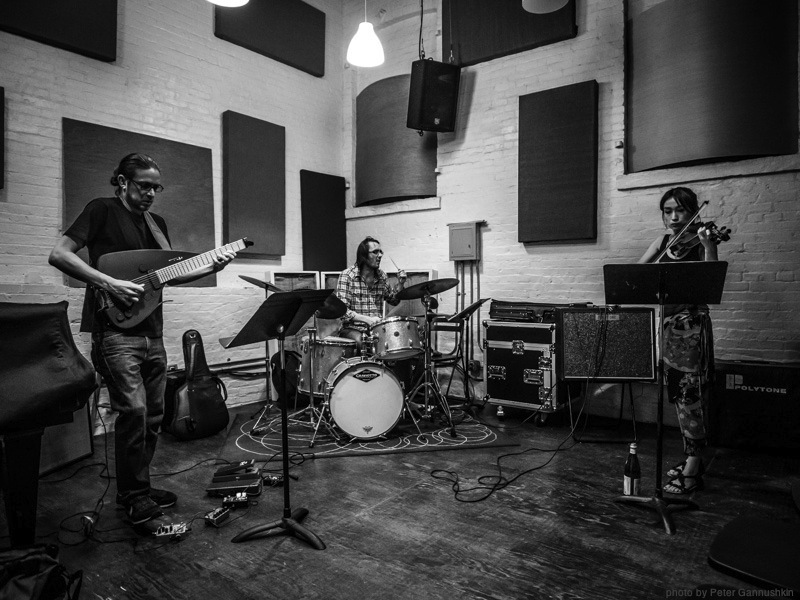 While Roundabout as a whole, takes a pianistic approach to radically reshaping jazz standards. In doing so, Harvey, elevates the interpretive possibilities of the guitar itself. 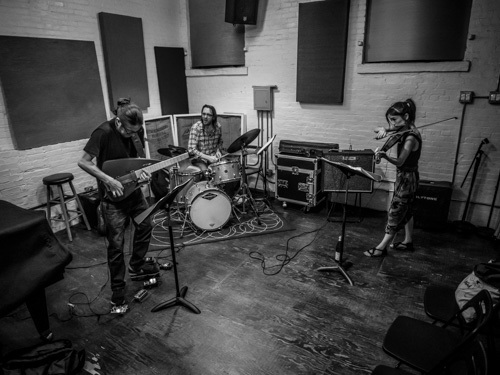 Harvey leads his own trio with Sana Nagano on violin and Joe Hertenstein on drums. Exploring the energy of a jazz/rock approach utilizing polyrhythm, atonality and compositional elements within improvisation. 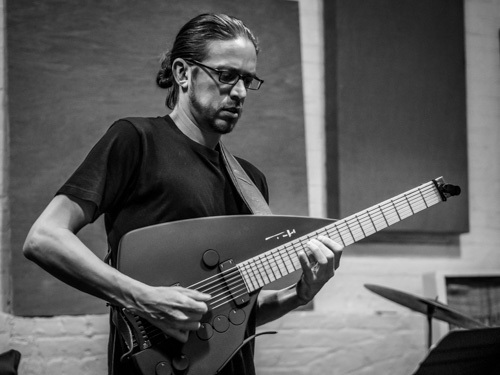 As an oud player, Harvey worked extensively with Middle Eastern Balkan Jazz Ensemble, Anistar, developing a repertoire that blended Middle Eastern forms with jazz improvisation. Also an Associate Artist with renowned experimental theater company, The Wooster Group, Harvey played electric guitar for Francesco Cavalli’s 1641 baroque opera, La Didone. This production toured Europe and had extended runs at St. Ann’s Warehouse in Brooklyn and Redcat Theater in Los Angeles. 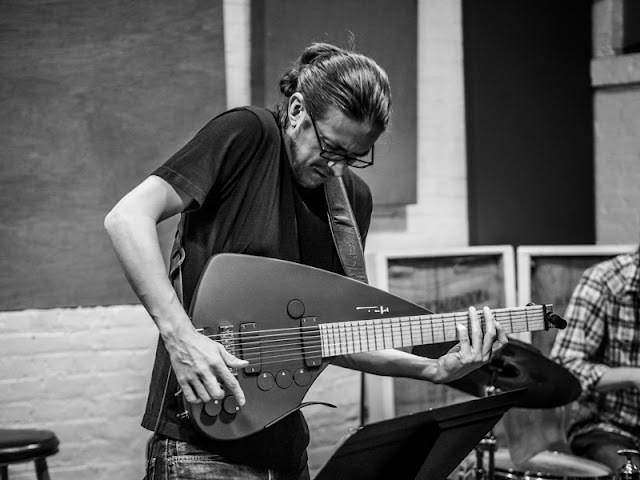 Harvey teaches Eastern and Western music styles, guitar, and oud both privately and in the NYC area. He is a featured instructor for TrueFire.com. He gives equal respect to the musical interests of students at all levels and emphasizes individual creativity. Harvey holds a BFA from The New School for Jazz and Contemporary Music. His studies have included lessons with Vic Juris, Andrew Cyrille, Reggie Workman, Jack Wilkins, Dave Fiuczynski, Najeeb Shaheen and many more. What do you remember about your ﬁrst guitar? My ﬁrst guitar was a Yamaha RGX312, a strat style electric guitar which I played through a small Marshall amp. I got it when I was 11 years old, and I thought that guitar was the coolest thing ever. I wanted to play it all the time, though I was struggling to learn, so sometimes I just sat and looked at it and tried to ﬁgure out how to make sound with it. As a young kid it gave me a tremendous amount of conﬁdence and attitude. 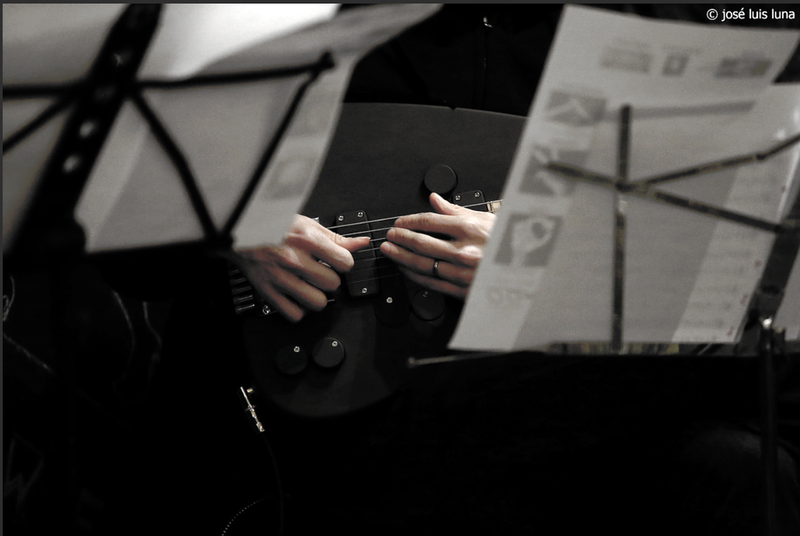 That’s when I discovered the powerful feeling of holding a guitar and playing music. Not much, in the sense that music is a surprising art form, and it’s tough to develop expectations around something that can be perceived in so many ways. My perception of music is always changing. As a listener, I often revisit music that I may think I know and hear it differently, and I’m always surprised by what music offers to anyone who decides to listen deeply. 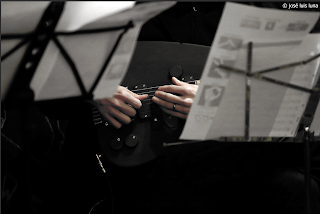 Roundabout is my ﬁrst record under my name, and I’m surprised by it because I never thought I would do a solo guitar record, let alone a solo guitar record of jazz standards. 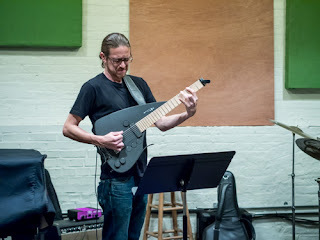 I enjoy playing standards as way to explore harmony, as a way to learn and apply compositional/ improvisational concepts, and as a way to just break open any preconceived notions as to how to play a tune. So, it kind of took me by surprise because playing tunes is not something I do in a group/performance setting very often. 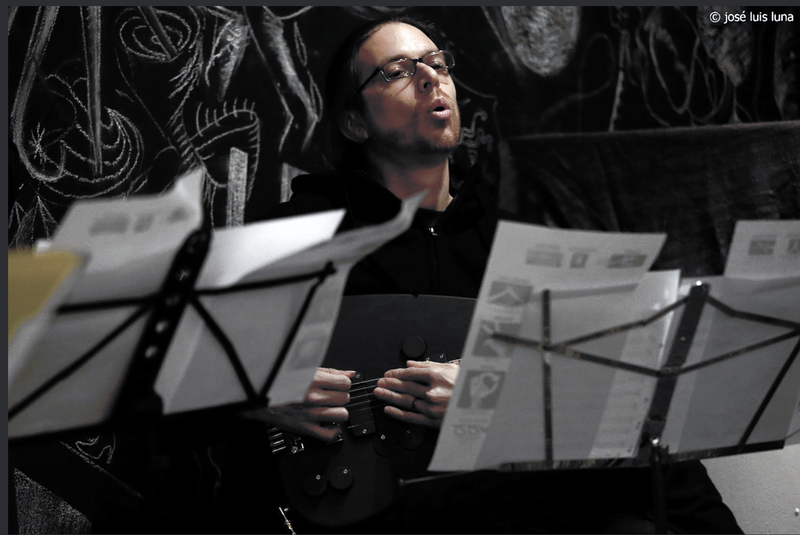 I’m mostly playing either my compositions, another composer’s music, or just free improv. 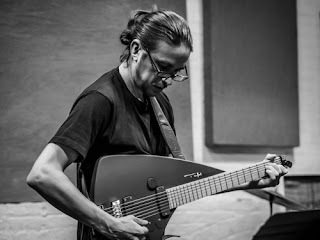 There was a moment where I thought, “Is this even relevant today to make an album of solo guitar standards.” So I guess I’m surprised by letting go of any judgement I might have had and committing to recording an album that has become an important step in my evolution of as an artist, musician, and guitarist. there always needs to be a balance between technical execution and feel. Honesty and an open mind. A good instrument can inspire and bad one one cannot. A bad instrument can inspire and a good one cannot. No matter the instrument, a player will sound like themselves. The idea that anyone needs a “great” instrument to produce “great” music is tied to the false idea that expensive is better. I am totally blown away, pretty regularly, by some Youtube video of someone making awesome music with tin cans. The story of the Junkyard Orchestra in Paraguay comes to mind. Personal self expression. Connection and communication with people. The intellectual challenge of always learning new things. Music is always there to challenge you. I started going concerts when I was around 12 years old, ﬁrst one being a quadruple bill of Sepultura, Napalm Death, Sacred Reich, and Sick Of It All. I was the youngest person in the room full of metal heads and skin heads. My sister who took me, was about to drag me out of there. Somehow I convinced her to go into that small club in the middle of NJ and sit through a thrash metal/grind core concert with me. The crowd was intense, the music was very loud, and the energy in the room felt like the place was going to explode. Learning to play the guitar is not an easy thing to do for anyone. It’s a physically challenging instrument, and the fretboard can be very confusing. So, the only way to make progress is to put some serious practice time in. This was not easy when I ﬁrst started, and it is still challenging in its own way today. But I had some great teachers along the way who really instilled the importance of regular practice. I have been very dedicated to the instrument from the moment I started playing, and all along the way there are moments of doubt and struggle, but I always come back to digging into the music and the instrument. So, in some ways persistence has been a great teacher. Which was the ﬁrst and last record you bought with your own money? What are your secret inﬂuences? Inﬂuences can be external or internal. I ﬁnd those internal experiences that shift my perceptions of music to have a huge inﬂuence on the way I hear, play, and create music. One experience I have is a sort of a spatial - visual mash up of musical perception. Oftentimes, I have this experience of seeing shapes in my mind and feeling the topographical distance between them. These shapes expand and contract and create a spatial-visual map of music in non-musical terms. The endless discovery. Music is so vast, it’s consistently surprising to me. I’m currently ﬁnishing up music for a short ﬁlm and I’m getting ready to release my trio record, PointcounterPoint, this coming April. 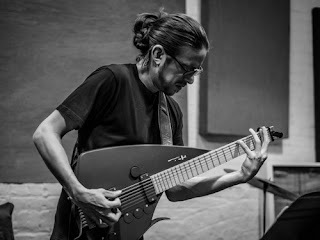 This fall, I’m looking forward to recording a duo record with the great Argentinian guitarist, Dario Iscaro. I have some ideas for another solo record and possibly a duo for guitar and drums.